A trip to Iceland has yet to grace my bucket list, but after seeing Land Ho!, I might have to rethink the matter. What an eerie, strange place to view haunting landscapes. 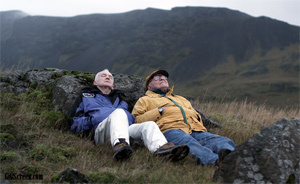 I know this because I followed the adventures — if that’s not too grand a word — of Mitch and Colin as they took to the road in Iceland in Land Ho!, a pleasant but somewhat negligible movie that’s most notable for focusing on men in their 60s. Mitch has spent his life as a surgeon. He and former brother-in-law Colin, a retired banker, were married to sisters. Mitch’s wife divorced him; Colin’s wife died. Directors Martha Stephens and Aaron Katz turn out a road movie that finds the two men sharing experiences as they prepare to enter life’s final act. Ebullient and vocal, Mitch is the more fun-loving of the two, a pot-smoking, good-time Charlie who wants to provide his sometimes dour pal with a diverting experience. The duo travels around in a rented Hummer, at one point hooking up with two young women (Karrie Crouse and Elizabeth McKee), one of them Mitch’s young cousin. Aside from the other-worldly landscapes of Iceland, Land Ho! offers the small pleasure of watching two older men dance around issues of mortality and increasing feelings of uselessness. Paul Eenhoorn gives Colin a reserve that’s also a bit judgmental. Earl Lynn Nelson, a real-life surgeon, proves good enough keep the movie from running off the road. Land Ho! should be applauded for avoiding Grumpy Old Men cliches, but it would have sacrificed none of its enjoyment had it dug a bit deeper.